Christopher Nolan's Batman films have seriously, sometimes ponderously, probed the ramifications of superheroes in the "real" world. Batman Begins used its rusted, humid underworld as a petri dish for urban bacteria into which its hero was injected like a test cure. The Dark Knight followed up on the consequences of that hero's success, replacing the low-level scum with a bigger, badder force that wreaked such havoc as a direct result of Batman's presence that one was left to wonder whether his presence made life for the people better or worse. 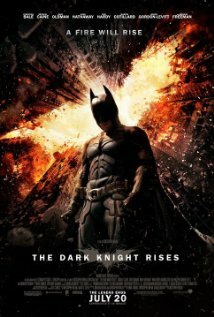 The Dark Knight Rises inverts that thematic dynamic to explore what happens in the hero's absence. TDKR picks up eight years to the day after the conclusion of The Dark Knight. On the anniversary of Harvey Dent's death, the mayor (Nestor Carbonell) holds a commemoration that flaunts the aggressive clean-up campaign waged in the late district attorney's name, one that has, apparently, rid the city of organized crime. As the mayor, then Commissioner Gordon (Gary Oldman) give their speeches, a shadow watches from above. Not the shadow of a bat, but a man, and a broken one at that, the silhouette of a cane and the bent shadow of the person holding it suggesting not Batman's imposing, fearful, symbolic strength but just a hobbled man. Such has become Bruce Wayne (Christian Bale), deteriorated physically from the strain of his days as Batman and mentally from the trauma of losing the friend in whom he believed and the woman he loved. But as another character tells Wayne not too long after, "There's a storm coming," one that will require the man to become a legend once more and handle a greater evil than ever before. That evil comes in the form of Bane (Tom Hardy), a thick-muscled, gas-masked terrorist who stands in stark contrast to the wiry Scarecrow and Joker of previous films. Bane is as capable of plotting absurdly complex, large-scale destruction as his evil predecessors, but he also has the bulk to go one on one with Batman's own bruising style of combat. His careful calculation does not innately terrify as does the Joker's erratic unpredictability, but Hardy ably works double time as a mastermind and, essentially, his own henchman. Furthermore, Bane's rationality, however severe and intolerant of failure, does prove alluring to the hordes of impoverished average citizens swept under ledgers in this supposed golden age for Gotham, and where Batman once had to contend with nothing more than a handful of devotees, now he must face down an entire army of riled lumpenproletariat. Nolan's blockbusters are all defined by an inability to trim, and The Dark Knight Rises suffers from more bloat than any of his other, overstuffed features. Before the Bane/Batman conflict even surfaces, Wayne must crawl his way back to fighting form, as well as deal with his ailing company, suffering losses from a mothballed clean energy project. The latter involves the investment of one Miranda Tate (Marion Cotillard), who also doubles as a possible love interest for Wayne. 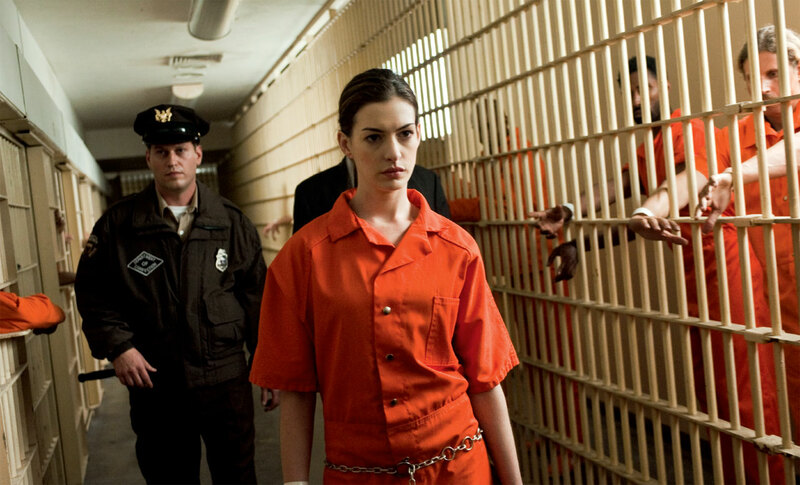 And then there is Selina Kyle (Anne Hathaway), a cat burglar who specializes in ripping off the rich. Nolan dangles Kyle out not only as a potential love interest but a potential villain to boot. Oh, and then, there is a Gotham police officer, Blake (Joseph Gordon-Levitt), an orphan who knows that Bruce Wayne is really Batman because of some kind of orphan Shining and wants Batman to come back after Gordon gets shot. Oh I forgot, Gordon gets shot early in the movie. These plot points stretch the narrative as it is, and Nolan eventually expands each of these strands until the film bursts at the seams. Nolan delights in playing chessmaster and trickster with his narratives, but he has so many pieces to move here that, despite the film's hefty runtime, large details fall through the cracks and time in general passes in the blink of an eye, a key flaw for a film that works best when emphasizing both the arduously slow journey of redemption and the breathlessly tight timeframe in which that journey must be undertaken. Explanations and clarifications of all these plotlines come through atrocious sound mixing, which buries dialogue and only occasionally gives any force to the more grandiose sound effects and score. The muffled dialogue would matter less were Nolan willing to let the images speak for themselves, but expository dialogue rears its head at every turn. When Cotillard's Tate reminds Wayne of their stalled project, she starts offering so many details she threatens to launch into a history lesson of fusion itself at any second. Characters offer up life stories with the slightest provocation, halting an already unwieldy behemoth. In the film's most unintentionally hilarious scene, one character launches into an overexpository description of a nefarious plan (one filled with already known details and sufficiently visualized with intercut shots of the action being related through speech) as the clock literally runs out of a major threat. But with fewer than three minutes to deal with a huge danger, Batman, Kyle and Gordon all stop and listen to this other character monologue. Yet if The Dark Knight Rises indulges the very worst of Nolan's tendencies as a filmmaker, it also expands upon his most appealing traits until even the flaws are subsumed into some kind of declarative auteur statement, even if Nolan's style is altogether too banal for such a thing to even be possible. Nolan's blockbusters all mistake scale for composition, but here he gets so grandiose he almost bridges the two. The opening sequence, of a mid-air kidnapping continues to stress the director's fetish for realism in ridiculously outsized stunts, yet for once Nolan embraces the sheer lunacy of what he shoots, setting the mood for his most successful fusion of huge spectacle and vague plausibility yet. Greatly aiding matters is a level of action coherence heretofore unseen in Nolan's work. At last, his close-combat filming achieves a genuine visceral effect because the director holds back just enough to let the audience follow along. Nowhere is this better seen than in the first brawl between Batman and Bane, which highlights Bane's strength and speed against the lumbering Bat and adds a level of savagery to each sick thud the villain lands on a formidable icon who suddenly looks so very weak. Elsewhere, Nolan brings back some of the loopier visual stylings of Batman Begins, especially in a tossed-off mini-sequence of Batman and Catwoman prowling the sewers looking for Bane, Catwoman distracting patrolling thugs as Batman pulls some Bat-tastic moves like upside-down grabs and a zig-zagging run in the dark illuminated only by the flash of gunfire. Late in the film, Wayne spends some time in a literal pit of a prison, its Escherian properties clearly dear to the director's heart. 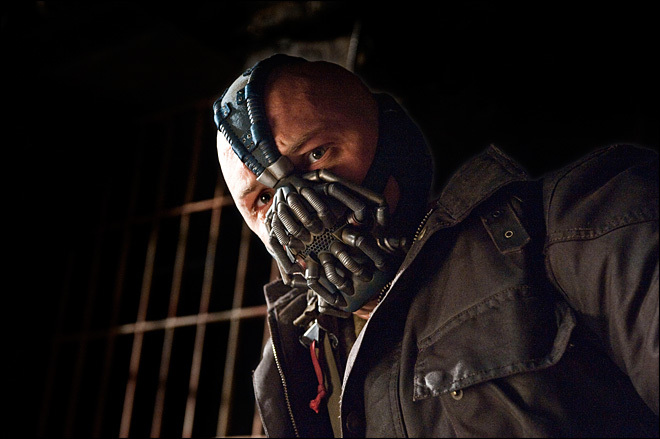 Nolan also has a ball when Bane's plan comes to fruition, plunging Gotham into a social uprising that bypasses Occupy for the French Revolution and makes for some of the best images of the entire trilogy. Indeed, nothing else in the film is so evocative, striking, and wonderfully insane as Jonathan Crane (Cillian Murphy) sitting atop a massive dais passing kangaroo court judgments on Gotham's wealthy. For a series that has only gotten more literal-minded as it has worn on, such brief breaths of ingenuity hint that somewhere in that fussy brain of his, Nolan actually has an imagination. These rare moments of respite become all the more treasured as the plot wears on and spirals out of control. Yet the ramshackle sequencing of the lugubrious plot is, to this writer anyway, inexplicably charming. Writing in total CYA mode, the Nolan brothers attempt to satisfactorily map out not only the various character and narrative arcs of the film but the muddled politics of this saga. The Dark Knight Rises offers evidence to support any reading. Batman, the billionaire hero, intervenes in a populist revolt and sides openly with the police in a street war. However, Bane's manipulation of Gotham's underclass stands in sharp, vile contrast to whatever disillusionment the people might feel. The most admirable, if wildly inconsistent, quality of Nolan's Batman films has been that of consequence, a rare trait of most comic book movies, with their weightless CGI and flippant bombast. Nolan does not come down on any one side of his many contradictory messages but demonstrates how actions ripple out and mingle until blame and righteousness matter less than simply solving a problem that has gotten out of hand. True, Nolan makes this point less through thoughtful examination than simply throwing everything he can at the screen, but he nevertheless ends up breaking down the simplistic good vs. evil conflict of so many superhero movies, including Nolan's last two. Nolan's best diversions, however, involve the space he gives to his actors. Bale's entropic performance as Wayne/Batman has always been the least dynamic element of these films, but his withered, defeated entrance in this film (and in the aftermath of a fight with Bane) clarifies that iciness as the mark of a man who has been broken since childhood. His literal shattering in this film is not a horrifying twist; it is the inevitable, physical bookend to the emotional devastation from which a little boy never recovered. Oldman, Freeman and Caine make it look almost too easy, especially Caine, who milks a part specifically written to wring tears from the audience for all it's worth. But once again, it's the antagonists who command attention. Hardy adopts a high, almost cheery voice that conflicts with his thick frame and obscured face. Before he sets in motion his attack on Gotham, he jovially praises a boy's on-the-nose singing of the National Anthem to himself ("What a lovely, lovely voice!") And though his eyes generally look well beyond everyone into a thousand-yard stare of simmering fury and cold thought, Bane reacts to the first sighting of the Batwing with a look of curiosity, nonverbally asking, "Where does he get those wonderful toys?" If the movie belongs to anyone, though, it's Hathaway, who steals the screen along with Martha Wayne's old pearls with a half-turn and backflip out of Wayne Manor and never gives it back. Hathaway plays up Selina's weaponized sensuality and captures the character's irritation with her own morality, so used to self-preservation that she cannot ever do the right thing without a hint of exasperation. Plus, in the morass of the film's politicking pile-on, only Hathaway manages to fully exhibit a clear social perspective as well as a change of heart communicated in a few glances of disgust and contemplation. Hathaway already proved her talent for portraying ambiguous, unpredictable characters in 2008's Rachel Getting Married, but it is no less thrilling to see her show it in a genre (and for a director) that typically has no clue what to do with women. Unfortunately, The Dark Knight Rises does not address some of the fundamental flaws of this trilogy. For a director who loves intricate mastermind schemes, Nolan does not particularly stress Batman's intelligence and ability to outsmart his foes, choosing rather to highlight Batman's ability to have 280 pounds of muscle and punch people in the solar plexus. And how sad it is that the one example of long-term planning on Wayne's part—the sonar grid of The Dark Knight—is far and away the low point of the entire saga, a sloppily executed and morally dubious setpiece. Nolan also lets his plots get away from him, and it is not to his credit that The Dark Knight feels like two films crammed into one and The Dark Knight Rises could be its own trilogy. Finally, this closing chapter builds off Inception to suggest that for all Nolan's supposed ambition as a mainstream filmmaker of ideas, his greatest desire is to helm a Bond picture. The Prestige, with its modest scale, perfectly interlocking mechanics and almost accidental profundity, remains his greatest film, indeed one of the greatest of the last decade. Yet The Dark Knight Rises is certainly the "most" Nolan film, a work that blends his talents and faults until distinguishing between the two becomes a pointless exercise. This near-three-hour film splits attention among a handful of major characters, all but two of whom, Wayne and Gordon, are brand new. It ties up every loose end it can even as it leaves major logic gaps unaddressed. It devotes a huge chunk of time to a political subtext that suggests any insight at all only through a barrage of surface-depth ideas. And frankly, this damn thing makes no sense on thematic or narrative grounds. And yet, on this thin foundation Nolan builds a behemoth, and what charm the film has lies in its ability to teeter incessantly without collapsing. To be honest, I wasn't sure if I liked the film on first viewing. Wasn't expecting it to be better than The Dark Knight, but half the time watching it I was like, "waat is going on?? Bane childhood wait no Ra's Al Ghul is a ghost wat Bruce likes two chicks they're both evil lol. JGL's in this movie I'm just waiting for him to be Robin looks like it's not happening oh wait THERE hahaha I knew it!" It was a fun movie, and that's pretty much what Nolan wanted. And the film does provide a great, kickass finale and closure to nearly everything seen in the previous 2 Batmans, but the film had a LOT of flaws that are just so glaring it makes you wonder if that's just part of the thing that makes it great. I think the films' pros were discussed in this review more than the cons. The cons could easily be written for about 3 pages. Which, quite frankly, for a Nolan film is just absurd. But the positives in this film are what makes it, because they're just so big. And Hathaway, oh man. I'd do that cat. Although I found The Dark Knight Rises ticking all the right boxes, I agree with you that The Prestige remains Nolan's best film.